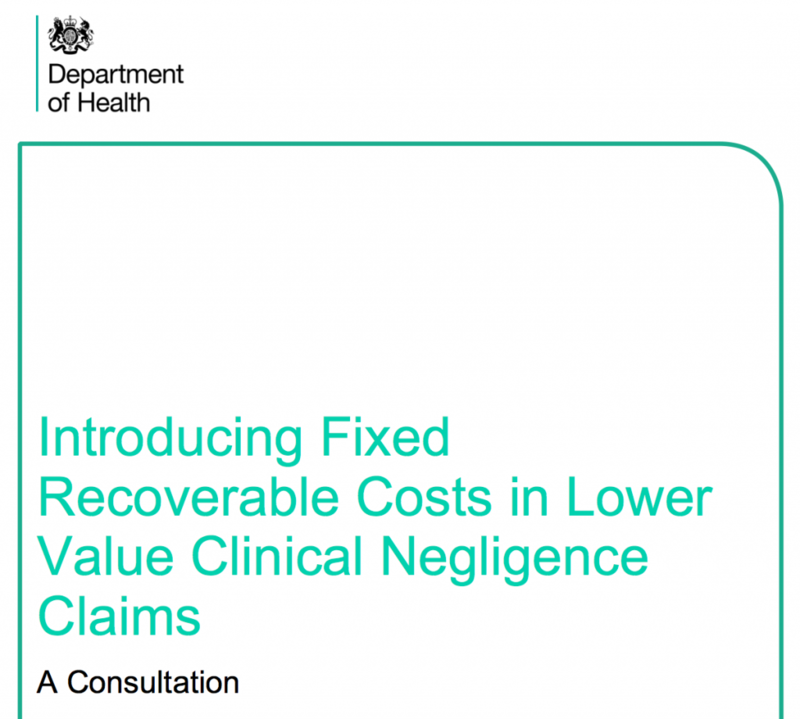 At first glance one might assume the Department of Health (DH) consultation on imposing fixed recoverable costs in clinical negligence cases is nothing to get exercised about. However, look a bit deeper and you will realise that these proposals are not about curbing so called “excessive” legal costs or all about lawyers. They would have a profound effect on patients’ rights, access justice, and the culture and safety of the NHS. The DH’s objective is to reduce the cost of clinical negligence cases so that savings can be invested in patient care. Who wouldn’t want that? However, the way that would be done is to impose caps on the amount of legal costs claimants can recover when they settle their claim (eg when it becomes clear it was a deserving claim). It wouldn’t matter how long and unreasonably the claim was defended. No more than the fixed amount could be recovered, no matter what the actual cost of challenging the denials actually was. DH’s ‘preferred option’ is to apply this scheme to cases with a monetary value of below £25,000. However, they may extend the scheme to cases of much higher value. Even if it were to be restricted to cases under £25,000, the monetary value of a claim is not an indicator of its seriousness or complexity. This approach could have very serious unintended consequences. One consequence is that many people who have claims ‘worth’ less than £25,000 simply won’t be able to get a solicitor who is prepared to represent them if liability is denied. The sorts of cases that will fall into this bracket include stillbirths, other child death cases and neglect of older people. (Because these groups do not tend to have income or dependants the monetary value of these claims are low). In many cases the actual legal costs can perfectly legitimately escalate well beyond the amount of the damages if liability continues to be denied. Many solicitors are in this field for the right reasons, but they work for commercial firms who cannot justify incurring costs that they will never be able to recover. Inevitably, many people will be left with no way of challenging denials of liability or of getting the compensation and accountability they deserve. It’s not just injured patients and their families who would be affected. Most of the cases affected by these proposals involve denials of liability which are eventually found to be inappropriate. If people are not able to challenge the denial, the NHS will continue to delude itself that it did nothing wrong and lessons will not be learnt to help prevent the same mistakes. Of course some of these cases would end up being taken forward. However, because of the very low caps on recoverable costs envisaged, even if a solicitor did agree to take a case on and won, they would be likely to have to recover some or all of the costs from the claimants’ actual damages. Such claimants could have most of their damages taken in helping meet the legal costs. The DH consultation does not even mention this likelihood. There are better ways to avoid both the human and financial costs of these cases. These proposals would have the opposite effect. Improving patient safety to avoid them in the first place is the obvious thing, and ensuring that there is adequate and appropriate staffing is key to that. Also, even when there has been an incident, if it is investigated properly, the causes identified and an admission of liability made early, almost all of the legal costs disappear. As recent reports like the CQC’s Learning Candour and Accountability make clear, the standard of local NHS investigations is inconsistent and often dire. If this was dramatically improved and if the Duty of Candour were complied with, again, most of the legal costs of litigation would be avoided. Sadly, not only the quality of investigations, but bad case handling, inappropriate denials of liability and protracted defence of claims add exponentially to the cost of claims which are settled. However, the Department of Health does not even consider how bad defendant behaviour on the part of its own agencies causes disproportionate costs. It pushed ahead with these proposals in the knowledge that the National Audit Office is reviewing the NHS Litigation Authority and reporting back later this year. Only a few years ago the Government took clinical negligence out of scope for Legal Aid against the wishes of even the NHS Litigation Authority itself, who recognised it was a cost- effective means of allowing the resolution of these cases. One last point of principle to consider. Is it right that one Government department with a clear conflict of interest should be able to drive policy which is not in its domain? Isn’t the reason we have a Ministry of Justice that such issues can be looked at objectively, with access to justice in mind, rather than the DH being able to fix the system in its own financial interests? This could set a very worrying precedent. The consultation closes on May 1st.